Along with other RMI member stations, AVTS Roadworthy Stations is offering free vehicle safety checks in preparation for road trips during the coming weeks. Let AVTS help you in keeping your family safe as you travel on the roads, while you make memories with those you love. Easter is here and the holidays are upon us. If you are going away, you have no doubt booked your accommodation, planned your route and decided how you are going to spend your well-earned break. But, have you thought about how you are going to keep your loved ones safe on the road? Is your motor vehicle safe and operating at peak performance? If not, bring your vehicle in for a free 10-point safety check between 11th and 18th April 2019 at any of the 7 AVTS branches conveniently located at strategic positions in and around Cape Town. (Please note that our Cape Town CBD branch is still closed for refurbishment). AVTS Roadworthy Stations offers a range of accredited statutory vehicle safety tests to ensure that you are made aware of any safety defects in your vehicle, so that you can make any necessary repairs before you set off on your holiday. AVTS free safety checks assess your vehicle’s 10 most critical safety features (eg tyres, lights, brakes, suspension, steering, wheel alignment) followed by a report highlighting any specific problems. Other AVTS services include number plates, microdot fitment, weighing of vehicles and registration and licencing services. AVTS Wingfield offers a free electronic diagnostic check with every roadworthy test. AVTS Roadworthy Stations, a member of the TUV SUD Group is a privately owned vehicle testing operation based in the Western Cape. Originally established in the Western Cape in 1992, AVTS became well-known as a pioneer in the industry, being the first of its kind in the Cape Peninsula. Backed by ISO 9000 certification, it has received numerous accolades over the years. How Do I Know if My Car is Roadworthy? You’ve got a new set of wheels and you’re ready to hit the road – but do you know if your car is fit to be on the road? A roadworthy car is one that’s in acceptable operating condition, to allow for safe driving or transport. Driving an unroadworthy car is illegal – not to mention dangerous. So, how can you tell if your car is roadworthy? A vehicle identification number (VIN) is a unique code used by the automotive industry to identify vehicles. The engine number and VIN must match those on the registration document. There should be no signs of tampering on any of the vehicle identifiers. If the engine has been changed, all associated requirements (such as police clearance) must be in place, and logged on eNaTIS). The car body and chassis must be free of rust or damage. The body must be free of damage that could cause injury to pedestrians or cyclists. All doors must be easy to open from the inside and outside. All doors must be firmly attached at the hinges. Interior door panels must be in place and in good condition. The odometer and speedometer must be in working order. All seatbelts must be in working order. The hooter must be in working order. Seats must be secure and free of damage. All lights and indicators must be in good working order. All lights must be securely fitted, with no ingress of water. Both low and high beam functions must be tested, as well as the level of the beams. The windscreen must be free of cracks. All windows designed to open must be able to open and close. Windscreen wipers must be operational and in good condition (i.e. blades not worn). Tyres and wheels must be the correct size. Tyres and wheels must fall within manufacturer specifications. All tyres (including the spare tyre) must have a tread of at least 1.6mm deep. Wheel bearings must run smoothly. Brakes on all wheels must be in good working order. Parking brake must be in good working order. Brake discs must be in good working order, and should not be grooved or concave. There should be no leaks from the hydraulic system. Shock absorbers must be in good working order, with no leaks. Kingpins, control arms and anti-roll bars must be secure. Chassis must not show any signs of weakness or damage. Undercarriage must be free of rust and leaks. The steering system must be in good working order. Wheel alignment must be within specification. The engine compartment should be free from damage and leaks. Engine and transmission mountings must be intact. The battery should be secured with the required number of clamps. The battery should be clean, and free of cracks or leaks. No loose or damaged wiring. Exhaust mountings must be secure. No excessive smoke from the exhaust. Transmission must be in good working order. All new and used cars sold in South Africa require a roadworthy certificate. A roadworthiness test at an accredited roadworthy centre like AVTS takes about an hour, and will cost just around R500. However, even if you’re not planning to sell your car, it’s important to make sure it is roadworthy and safe to drive. Many testing centres also offer vehicle inspections, so you can check up on the condition of your car, or enjoy better peace of mind before taking a long trip. Make sure you’re driving a roadworthy car, and help to reduce the number of unsafe vehicles on South African roads today. Customers who come for a roadworthy test at the AVTS Wingfield branch, will soon benefit from a free electronic car diagnostic check. The process will see all the data of the vehicle systems being accessed, and a condition assessment given for each of the systems. It will identify defects or indicate that all is in order. The diagnostics tool being used connects wirelessly via Bluetooth to the vehicle. A report will be provided which will then act as a guide for those aspects of the vehicle that need attention. The service was launched at AVTS Wingfield, with demonstrations on several makes of vehicles. This service is being offered free of charge to customers for come for a roadworthy test, and who do not receive any trade, fleet, pensioner or student discount and will be available from the 1st April to 30th May 2019. While any arriving customer can be served, it is preferable to make a booking requesting the branch of Wingfield, and selecting the A-lane-Wingfield option. AVTS is positioning its Wingfield branch as a centre of excellence for car diagnostic checks. The team, headed by Test Station Manager, Brandon Oliver have a strong interest in adding value to motorists, and in helping them get to know the condition of their vehicle. 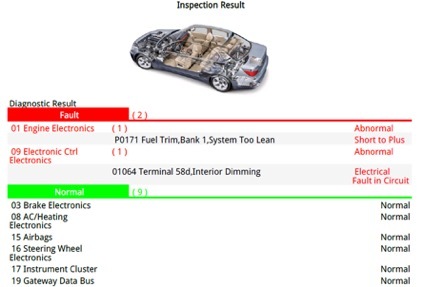 A small extract of the Car Diagnostic check report is given below. For enquiries, please contact us or call the branch on 021-592 4522.